Last year IFLA used the momentum of the day to call for government action, and to join forces with libraries in addressing the on the challenges in digital preservation and to raise awareness of the issues libraries are facing in preserving digital heritage. 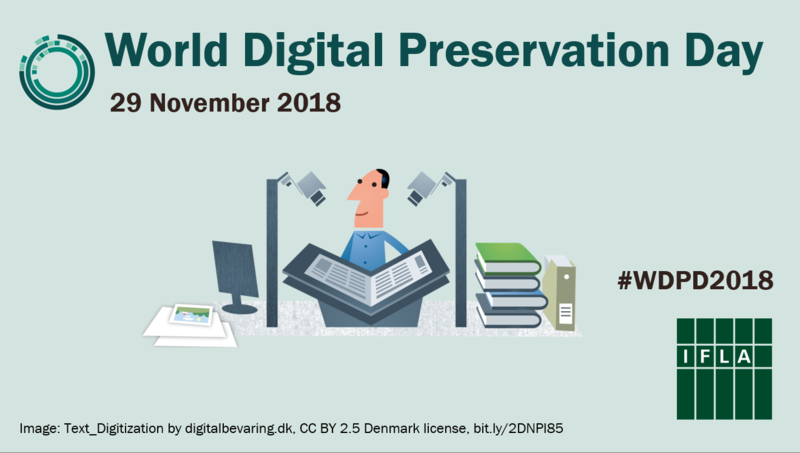 This year we will be celebrating World Digital Preservation Day by celebrating all the great ideas, projects and efforts that libraries have been making to overcome the challenges associated with effective digital preservation. Before starting the celebration, let’s first outline what is meant by digital preservation. Digital preservation is defined as the formal activity of safekeeping digitally stored information. It requires policies, planning, resource allocation and appropriate technologies to ensure access to digital information for as long as necessary. This is where libraries come in! Libraries have a central role in preserving and promoting cultural heritage, including modern-day history of digital collections and materials. IFLA supported the disseminating of a PERSIST survey to get a global overview of the existence and implementation of policies and strategies for preserving born-digital materials, and to assess the role that governments assume therein. The survey results showed that libraries are facing difficulties in digital heritage preservation often due to the lack of knowledge, funds or policies. The report also showed that there is a need to advocate for preservation efforts and increased public awareness, as well as the need for common standards and ways to approach this issue. Libraries all over the world have to deal with fast growing numbers of digital materials that need to be safeguarded. Despite the many challenges libraries are facing, they are committed to preserve and provide access to documents or information that have permanent or continuing value. To celebrate the World Digital Preservation Day we want to highlight some of the many great initiatives, but without forgetting that comprehensive digital preservation is too big an issue for any individual institution to take on alone. IFLA has worked on the challenges around digital preservation for years, both through the UNESCO PERSIST project and also within our sections on National Libraries, Preservation and Conversation and our PAC Centres. In 2016 the first ever Preservation and Conservation (PAC) Centre specialised in digital preservation were created. The PAC Centre is based at the National Library of Poland and supports the needs of libraries concerning digital preservation and digital sustainability. The PAC Centre is currently conducting a series of surveys covering libraries’ needs in the field of digital preservation and conservation to develop a set of recommendations for long-term preservation. An English survey will be available next year, we’ll make sure to keep you posted. Other PAC Centres have made digital preservation one of their main focus areas for the coming years. The PAC Centre at Biblioteca Nacional Chile are currently developing a special training program on digital preservation. The PAC Centre at the National Library of Korea is also focusing on digital preservation. Libraries worldwide are working to preserve our digital heritage, but they cannot do it alone. It has to be a shared responsibility! The UNESCO PERSIST initiative has offered some ideas to what action may be taken, and it is clear that preservation policies must be put in place. IFLA supports the dialogue between libraries and policy makers, only by joining forces can our heritage be preserved.